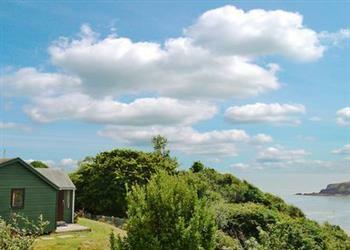 Log Cabin in Freshwater East sleeps 5 people. Lying on the edge of Pembrokeshire Coastal Path, with fantastic views of Freshwater East Bay, this detached, single storey holiday lodge, accessed by rough track, provides a perfect touring base for a family looking to explore Pembrokeshire. Conveniently located, the area abounds with fantastic walks and is within easy walking distance of the village country pub. Visit the nearby harbour towns of Tenby and Saundersfoot or take a boat ride over to the serene and tranquil Caldey Island where the monks have continued the traditions as a holy island. For an adventure day out, visit Oakwood, Bluestone and Folly Farm. Shop 2 miles, pub and restaurant 500 yards. All on ground floor: Living/dining room. Kitchen with low beams. 3 bedrooms: 2 double, 1 single. Bathroom with shower over bath and toilet. Electric heaters, electric and bed linen included. Freeview TV. DVD. Stereo/CD. Electric cooker. Microwave. Large enclosed lawned garden with patio, sitting-out area and furniture. Bar-be-que. Parking (2 cars). Welcome pack. Pets free of charge. No smoking. Easy walking access. Holidays run from Friday to Friday. For a better idea of where Log Cabin is, you can see Log Cabin on the map below. Log Cabin is in Dyfed; should you be on the lookout for a special offer, you can find all the special offers in Dyfed. It's always worth checking to see what is on offer at the moment. Do you want to holiday near Log Cabin (28982), you can see other cottages within 25 miles of Log Cabin; have a look to find your perfect holiday location.